One growth is a fan of leaves that could potentially be a single plant. 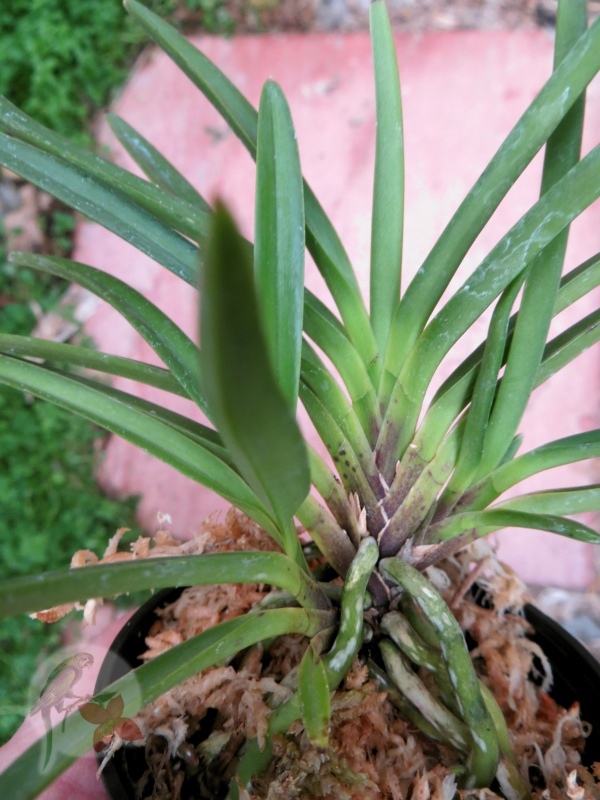 When you look at a standard vanda, those are usually single fans; they’re just really tall. Neos don’t usually grow very tall; their growth habit tends to be bushier. 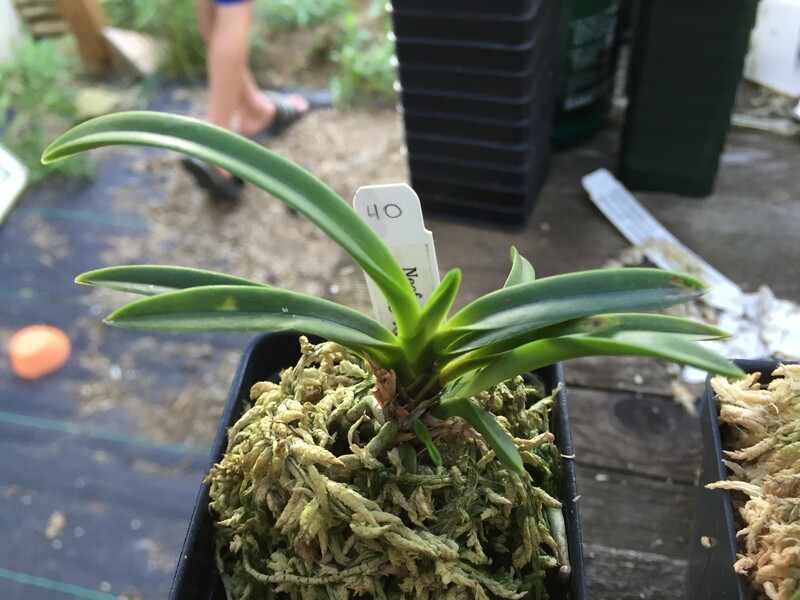 They produce new growths from the base of the plant after the existing fans reach maturity; this is typical of monopodial orchids. The bigger your plant becomes, the faster you will see it increase in size as each mature growth makes new growths. Exciting! 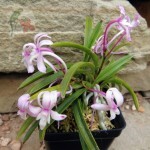 Neofinetia falcata reaches maturity (blooming size) when it has six leaves. 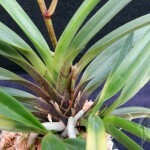 Spikes arise from the third leaf margin from the top (see the tiny beginning of a spike in the right-hand picture above). Each mature growth in a plant can produce a flower spike, so the larger your plant is, the more spectacular your flower display will be. 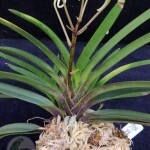 Sometimes a single fan will produce two spikes, one from the third leaf margin on each side! Each mature growth can bloom every year. Technically, each growth of a Neo is capable of living on its own. To make sure the “split” is successful, each resulting plant needs to have good roots so it can feed itself. I like to see at least three roots. That said, some varieties, like Seiryujishi, fall apart almost as soon as a new growth reaches maturity, often with only two roots on a growth. Many pink-flowering varieties like Shutennou make many new growths without making any/many roots on the babies. Those varieties are very hard to split even when the plants are fully mature. 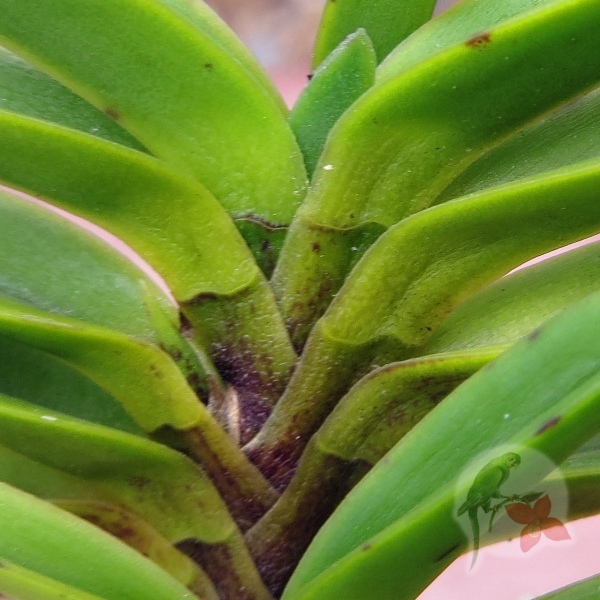 If you are a collector, you should only divide your plants (of any species) if (1) you want to share with a friend, (2) there is a dead/damaged growth you want to remove, or (3) you want to adjust the position of growths. This last reason is common in Japan where growers will dismantle plants and put the growths back together in the same pot but in a more visually pleasing arrangement. Larger plants, however, share roots and, therefore, resources which allows them to grow more quickly. Think about three people living in one house vs. three separate houses. Sharing a single house allows each person to spend their extra resources in more fun ways. When plants share roots, they can devote their extra resources to growth and flowers. That’s why I suggest you buy multi-growth plants when you can. If you have other questions, please let me know so I can address them for other growers as well.